Science fiction dream team Alan Tudyk (Firefly, Frozen, Dodgeball: A True Underdog Story, 42, I, Robot) and Nathan Fillion (Firefly, Castle, Monsters University, Dr. Horrible's Sing-Along Blog) are blasting off once again to bring a sci-fi show to life. This time, the former captain and pilot duo are launching a campaign on Indiegogo, the world's largest crowdfunding platform, for a brand new web series titled Con Man. The series is a lighthearted take on the personalities, luminaries, comic book stores, and characters they have run into during their years in the sci-fi community and convention circuit, while telling the story of a guy learning to love and embrace his fans. Fans can contribute to Con Man now on Indiegogo here: Indiegogo.com/Projects/Con-Man. Here's what Alan Tudyk had to say about the project in a statement. "If you've gone to a sci-fi convention, you've only seen half of it. Con Man delivers what convention 'All-Access' passes have only promised in the past. I've been to conventions from San Diego to Dubai and I have so many great experiences to share through the world of Con Man. The sci-fi fans have changed my life and I want to give them a chance to see a new view of the world they built. I hope that the fans will join me in making this series a reality by supporting my Indiegogo campaign." Nathan Fillion had this to say in his statement. "I'm here to say, 'WOOOO!' and you can quote me. Let me explain: Alan has, for the entire time that I've known him, never failed to impress me with his talent. Don't think I'm blowing smoke here, because it kills me inside to say it, but he's better than me. We've all seen his acting, but until you know him as a writer, you're being short changed. I'm not one who needs to fill every waking moment with the 'next project', but I truly believe people need to see what Alan is capable of, and I'm ready to do what it takes to show them. So, buckle up, peeps. Alan's driving, and I'm sticking my head out the sunroof screaming 'WOOOO!'" Alan is writing, directing, starring, and providing craft services for Con Man. Nathan is producing the series and once again taking the helm as captain of a ship in a regular featured role. Alan and Nathan will be joined by a crew of sci-fi fan favorites Sean Maher, Gina Torres, James Gunn, Seth Green, Felicia Day, and Amy Acker with more guest stars being announced throughout the campaign. Con Man is also produced by PJ Haarsma. Con Man centers around the post-show life of Wray Nerely, (Tudyk) the pilot and co-star of Spectrum, a sci-fi series which was cancelled before it's time and eventually became a cult classic beloved by fans. Wray's good friend, Jack Moore (Fillion) starred in the series and has gone on to become a major celebrity, while Wray continued to struggle to find his big break. While Jack enjoys the life of an A-lister, Wray tours the sci-fi circuit as a guest of conventions, comic book stores, and lots of pop culture events. The show will explore all the weird and crazy things that happen to Wray along the way, while telling the story of a guy learning to love and embrace his fans. All fans that contribute to the campaign will have access to exciting and limited edition perks such as an exclusive backer blog, posters, Wray Nerely and Jack Moore headshots, signed Con Man scripts and props, set visits, private screenings and even the chance to be a background character on the show. For more information on the campaign and to contribute, visit Indiegogo.com/Projects/Con-Man. In just a few short hours, Con Man has already met its $425,000 fundraising goal, but that is just for the first three episodes, so fans can contribute more to ensure more episodes will be produced. 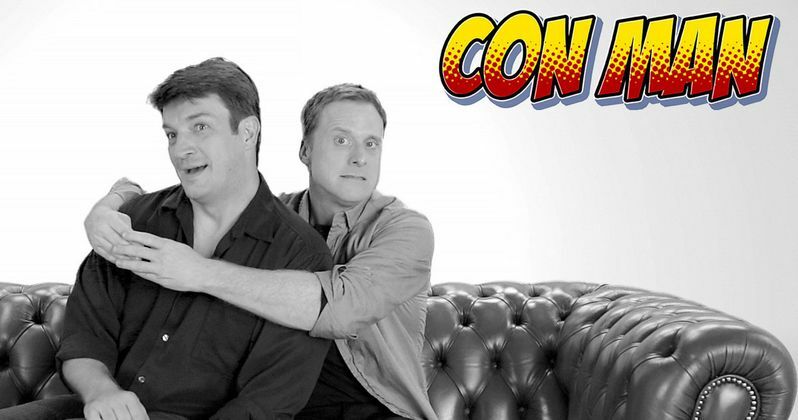 Take a look at Alan Tudyk and Nathan Fillion's pitch video for the new web series, along with the new poster, and CLICK HERE to visit the project's IndieGogo page to learn more about the exclusive benefits for contributing to this project.